(Atlanta, GA) – The City of Atlanta unanimously approved raising all city workers to a $15 minimum wage as a part of the FY2018 Budget vote. City of Atlanta workers will receive at least $13 per hour on July 1, 2017, $14 per hour in 2018, and finally to a $15 minimum wage in 2019. Over 1000 firefighters, sanitation, parks & recreation, watershed, and other employees will now see their wages move up to at least $15 an hour, moving many of them out of poverty. Seven year Atlanta parks and recreation worker Marquee Scales who earned just $12.85 before the move said “I am abundantly thankful that the Council and the Mayor have decided to prioritize the needs of all workers in this budget”. Atlanta Jobs with Justice held the first fight for $15 rally in 2013 to support fast food workers going on strike for $15 and a union. The courage of workers that day showed that today’s victory for workers was possible. 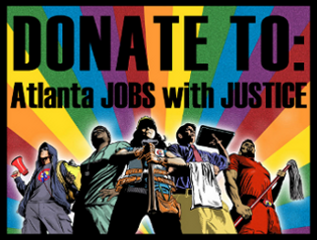 Atlanta Jobs with Justice has been working with city workers, community, labor, and faith organizations since 2016 to advocate that the City of Atlanta restore its promise of living wages from 2005. “Now with this vote, city workers can see a brighter future that provides for their basic needs, especially as the cost of living in the city has been rapidly increasing.”, Neil Sardana Atlanta Jobs with Justice Coalition Coordinator. 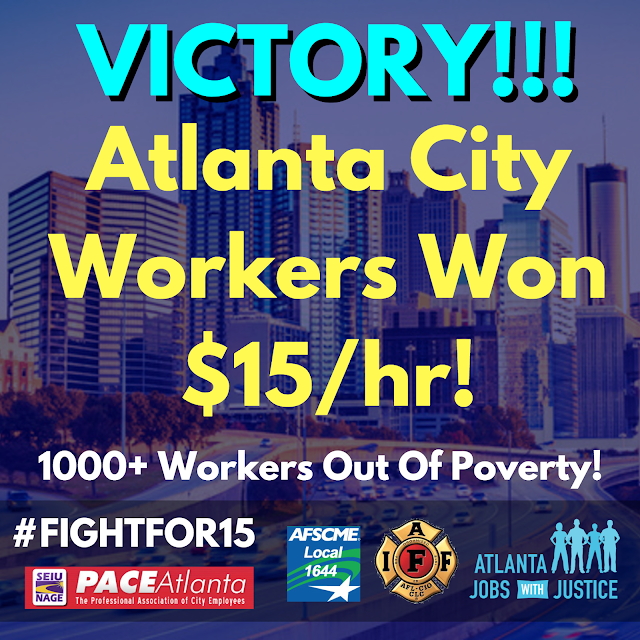 Atlanta is the latest victory in the Fight for $15 movement which has swept the nation with workers of all backgrounds standing up for fair wages and the right to unionize. per hour for their employees. This win today is proof that Georgia and the South are still moving forward with a commitment to living wages and working families. This policy stands in stark contrast to Georgia’s minimum wage of $5.15 an hour, one of the lowest state minimum wage policies in the nation. It also raises a concern over Georgia’s Minimum Wage Preemption Law which forbids city and county governments from raising the minimum wage in the private sector. Atlanta Jobs with Justice will continue to fight to make sure all workers earn a living wages. The Atlanta $15 minimum wage ordinance championed in partnership between Atlanta Jobs with Justice, ATL Raise Up, AFSCME 1644, PACE Atlanta, Atlanta Professional Fire Fighters, individual city workers, Councilmembers Felicia Moore, Andre Dickens, and Carla Smith.